Fortuitously, the Ministry of Health and Family Welfare, Government of India, and other health agencies, have started recognizing the importance of stroke prevention and management and have funded local stroke registry development efforts. However, current efforts remain hampered by the extant issues, such as the lack of basic infrastructure, which includes the lack of emergency services with neuroimaging facilities, dedicated stroke teams, stroke units, as well the existence of nonstandardized protocols. In addition, limited availability of resources and well-trained research personnel to acquire accurate data, and the use of varying definitions to define the same types of data sets make it difficult to share and compare data. It is imperative to develop methods to promote awareness of stroke symptoms, improve transportation, and educate the treating teams at local hospitals to facilitate an early referral to the stroke centers for a timely imaging, diagnosis, and treatment, and to enhance the existing knowledge and infrastructure. India has also witnessed advancement in stroke services at the state levels for acute stroke management using smartphone-based low-cost technology for remote areas. Over the past decade, the U.S. National Institutes of Health and National Institute of Neurological Disorders and Stroke (NIH-NINDS) has recognized that important questions related to stroke will require collecting and (for statistical power) pooling of phenotypic, imaging, and genetic data from multiple sites. With foresight and careful planning, the NINDS has funded the creation of nationwide stroke databases that have fostered collaborative research in the fields of stroke epidemiology, genetics, imaging, and therapeutics. However, the ongoing U.S. efforts lack multiethnic data, and the pace of scientific discovery and clinical trial execution remains slower than desired. 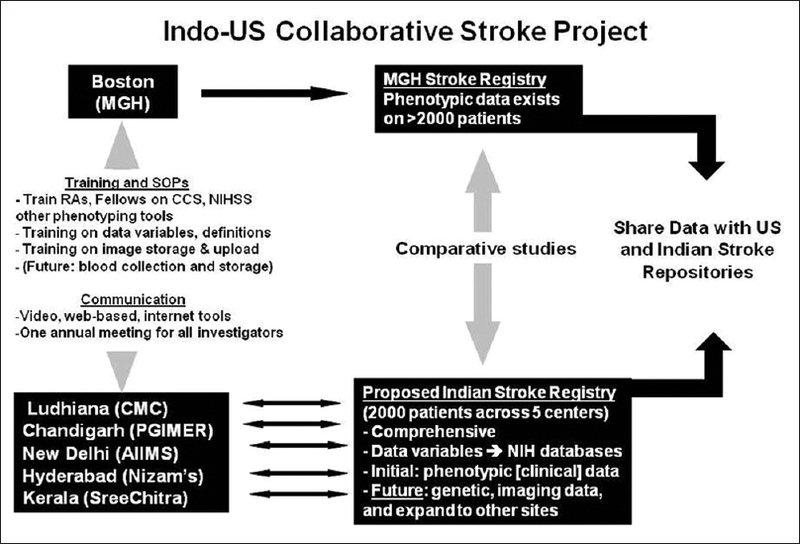 The Indo-US Collaborative Stroke Program (IUCSP) is one such program which seeks to leverage the existing U.S. NINDS-funded stroke infrastructure and national registry and database efforts, to (a) prospectively collect Indian stroke patient data in a format that will enable comparative analysis within and between stroke centers in India and USA, resulting in stroke quality improvement; and, (b) train a core group of stroke researchers within a network of Indian stroke centers, to create a robust infrastructure that will enable future stroke clinical and research trials and collaborative clinical, genetic, and imaging studies. The collaboration is constituted by five geographically diverse Indian stroke centers and one U.S. hospital, which are large academic teaching institutions with well-organized stroke programs, written protocols, and trained stroke experts. Stroke patients would be undergoing laboratory and imaging evaluations based on clinical indications. All the centers have advanced stroke imaging [computed tomography/magnetic resonance imaging (CT/MRI)] capability and vascular ultrasound. Data collection is planned for approximately 2000 patients, to allow for an internal comparative analysis as well as comparisons against the Massachusetts General Hospital (MGH) stroke registry. The data will be shared in a manner approved by local Institutional Review Boards/Institutional Ethics Committees, using Health Insurance Portability and Accountability Act (HIPPA)-compliant procedures. Approved end-users will have free access to enter and view data. De-identified data will be shared with existing national stroke data repositories [Figure 1]. A steering committee comprising lead researchers from the six participating centers will oversee data sharing and collaboration. Data will be entered in a secure web-based electronic platform. Data variables will include a comprehensive set of fields from the NINDS Stroke Common Data Elements and American Heart and Stroke Association's Get-with-the-Guidelines initiatives, as well as certain fields specific to the Indian stroke setting (for example,“beedi” and “paan” consumption). Data definitions consistent with the US-based registries will facilitate prompt and accurate comparison. The research coordinator and the research assistant will collect data of the recruited patients based on the inclusion and exclusion criteria [Table 1] on demographics, risk factors, prehospital care, thrombolysis, inpatient management including quality of care, complications, laboratory test results, imaging, medications, and outcomes until 90 days. Training and supervision will be conducted by two Project Managers located in India and USA via periodic conference calls, video conferences, in-person visits, and annual investigator meetings on the National Institutes of Health Stroke Scale and the modified Rankin Scale. They will be trained on using the web-based “Causative Classification of Stroke” tool to assign stroke mechanism (ccs.martinos.org) and to interpret brain imaging findings. As far as possible, the onsite principal investigators will work with the research associates to determine stroke mechanism and interpret brain imaging abnormalities. Training sessions will be particularly focused on data definitions for key variables, for example, hypertension and nil-per-oral. Data accuracy will be confirmed with chart audits, database queries, and logic checks. The innovation of this project lies in the use of existing knowledge and NIH-funded resources in USA to develop a shared “Informatics Platform” in India that will be readily accessible via the internet, allowing cross-site and cross-country collaborative research to occur instantly. The platform will rapidly advance science and increase the return-on-investment already made by US and Indian Governments in the field of stroke research. The long-term plan is to expand the registry to additional sites and to begin collaborative neuroimaging, clinical and genetic studies in stroke. It is hypothesized that a powerful and detailed study comparing stroke in India versus USA will help to reveal new etiological insights. Creation of an informatics platform via the proposed Pilot Indian Stroke Registry, using data fields and definitions consistent with existing NIH-funded efforts, will enable collaboration in future genetic and imaging-based studies, thereby enhancing the scope of ongoing NIH registries efforts in USA and around the world. The training and infrastructure development proposed herein will integrate the research capabilities of several high-volume stroke centers across India with centers in USA, enhancing the pool of stroke centers that can collaborate to conduct more efficient stroke therapeutic trials. From the Indian standpoint, the collaborative Pilot Indian Stroke Registry will provide standardized and accurate information on stroke risk factors, thrombolysis, in-hospital complications, and outcomes from different regions, while from the US standpoint, this proposal will enhance the significance of NIH-funded research by bringing in a large volume of data from a multiethnic population. The training and infrastructure developed as part of this proposal will augment ongoing local and regional efforts. It is anticipated that this effort will allow Indian researchers to collaborate with colleagues around the world and contribute to cutting-edge science and quality improvement efforts. NIH, USA- 1 R21 NS077442-01 and Department of Biotechnology (DBT), India- BT/MB/BRCP/08/2011. Strong K, Mathers C, Bonita R. Preventing stroke: Saving lives around the world. Lancet Neurol 2007;6:182-7. Sitzer M, Skutta M, Siebler M, Sitzer G, Siegrist J, Steinmetz H. Modifiable stroke risk factors in volunteers willing to participate in a prevention program. Neuroepidemiology 1998;17:179-87. Mathers CD, Lopez AD, Murray CJ. The burden of disease and mortality by condition: Data, methods, and results for 2001. In: Lopez AD, Mathers CD, Ezzati M, Jamison DT, Murray CJ, editors. Washington (DC): The International Bank for Reconstruction and Development/The World Bank; New York: Oxford University Press; 2006. Indian Council for Medical Research. Stroke. In: Assessment of the burden of non-communicable diseases: Final project report. New Delhi: Indian Council of Medical Research; 2004. p. 18-22. Pandian JD, Singh G, Kaur P, Bansal R, Paul BS, Singla M, et al. Incidence, short-term outcome, and spatial distribution of stroke patients in Ludhiana, India. Neurology 2016;86:425-33. Sridharan SE, Unnikrishnan JP, Sukumaran S, Sylaja PN, Nayak SD, Sarma PS, et al. 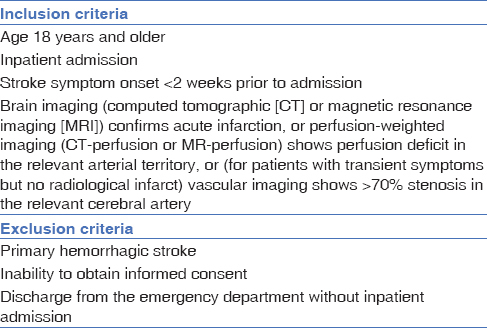 Incidence, types, risk factors, and outcome of stroke in a developing country: The Trivandrum Stroke Registry. Stroke 2009;40:1212-8. Dalal PM, Malik S, Bhattacharjee M, Trivedi ND, Vairale J, Bhat P, et al. Population-based stroke survey in Mumbai, India: Incidence and 28-day case fatality. Neuroepidemiology2008;31:254-61. Gourie-Devi M. Epidemiology of neurological disorders in India: Review of background, prevalence and incidence of epilepsy, stroke, Parkinson's disease and tremors. Neurol India 2014;62:588-98. Dalal PM. Burden of stroke: Indian perspective. Int J Stroke 2006;1:164-6. Kaul S, Bandaru VC, Suvarna A, Boddu DB. Stroke burden and risk factors in developing countries with special reference to India. J Indian Med Assoc 2009;107:358,367-70. O'Donnell MJ, Chin SL, Rangarajan S, Xavier D, Liu L, INTERSTROKE investigators, et al. Global and regional effects of potentially modifiable risk factors associated with acute stroke in 32 countries (INTERSTROKE): A case-control study. Lancet 2016;388:761-75. Badachi S, Mathew T, Prabhu A, Nadig R, Sarma GR. Hurdles in stroke thrombolysis: Experience from 100 consecutive ischemic stroke patients. Ann Indian Acad Neurol 2015;18:415-8. Das S, Hazra A, Ray BK, Ghosal M, Chaudhury A, Banerjee TK, Das SK. Knowledge, attitude, and practice in relation to stroke: A community-based study from Kolkata, West Bengal, India. Ann Indian Acad Neurol 2016;19:221-7. Sharma S, Padma MV, Bhardwaj A, Sharma A, Sawal N, Thakur S. Telestroke in resource-poor developing country model. Neurol India 2016;64:934-40.